Move over, Frozen! There's an old guy in town! His name's Hans Christian Andersen and he wrote a story about an evil troll who creates a magic mirror that distorts the appearance of everything it reflects. This mirror is used to make the loveliest of landscapes appear like "boiled spinach." There is an attempt made to carry this mirror into Heaven to mock the angels with, but the mirror slips during the journey and falls to earth, shattering into a myriad of pieces of all shapes and sizes. Pieces of the mirror are blown all around and land in people's hearts and eyes, eventually freezing their hearts. 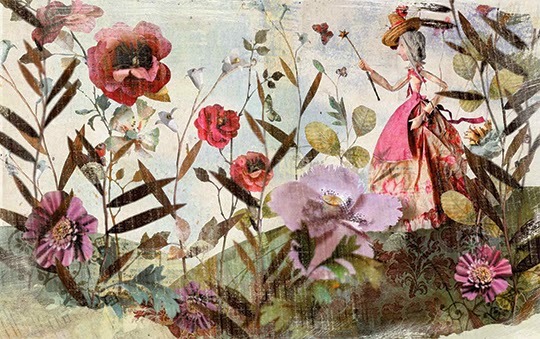 In Andersen's tale, we also meet characters like Kay (a boy) and Gerda. These two have grown up together and are the best of chums until one day when a sliver from the broken mirror falls into Kay's eye and heart. His heart then begins to grown stone cold and he is attracted away from Gerda and the life he knew by an evil snow queen. Hans Christian Andersen's story focuses on Gerda's quest to find Kay and to release him from his evil and enchanted imprisonment. It is a deeply moving tale of true friendship and the war between good and evil. Disney caught hold of this story and couldn't "let it go" (clever. I know.) and our world will likely never be the same. But what a pity if we all let Disney do all of the story telling without taking a time to dive into the rich original work by Hans Christian. 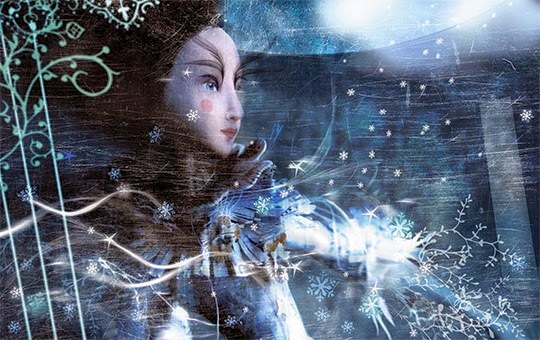 Andersen first published The Snow Queen in 1844. It is one of his most highly acclaimed stories and that is the case even before Disney stuck their fingers in it. I read the original work to my kids earlier this year and we enjoyed it very much. It's a powerful, imaginative and thoughtful story - one worth hearing over and over again. Because I think it is worth listening to in its original form (repeatedly) I was delighted to see that Barefoot Books offers a beautifully illustrated edition by Miss Clara and "retold" by Sarah Lowes. (I can't say I noticed any deviations from the original story in this retelling. Unless I'm terribly mistaken, only language was changed but not substance.) Furthermore, this edition of the book offers a CD for you to listen to as many times as you like. (Bonus: Lowes is British. Therefore she has an English accent. Therefore I have enjoyed listening to the story many times over just because she makes it sound beautiful.) Each of my kids has listened to this particular edition and each of them has enjoyed it. Least you get the wrong impression of me, I do like Disney very much but I'm not the world's biggest fan of Frozen. In this case of this story, I might not mind my kids watching the movie but I would much rather them read the book and know "what really happened" because it is ever so much deeper and thought provoking a story than Frozen is. Beautifully told, beautifully read and beautifully illustrated - I have a hard time seeing anything wrong with this one and encourage you to check it out! Many thanks to Barefoot Books for sending a copy of this book my direction for the purpose of facilitating this review. I received no additional compensation and all opinions are 100% my very own. I have been wanting to read this story since Frozen and now the Frozen characters in Once Upon a Time. This sounds like a lovely edition. I agree with you about the original books compared with the Disney version. I would not watch Mary Poppins when it first came out. I had seen the ads, and the Mary Poppins of the book was not young and beautiful! I wouldn't have it (but I have seen the movie years later, on TV). 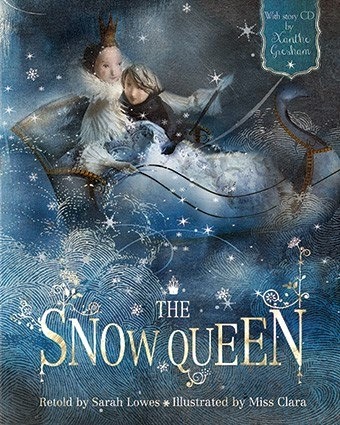 I haven't read Anderson's The Snow Queen, but I want to. Thanks for the recommendation and the link. This sounds wonderful. I was just thinking the other day how fun it would be to read the original stories from all of the Disney princess movies. I would like my children to have read them as well. Thank you for the review. I will be heading over to purchase a copy! I just finished listening to the audiobook version of this story and posting a review, and I remembered your discussing it and wanted to come back and remind myself of what you had said. I agree- it's a very rich and moving story, and though Disney's version is pleasant in itself, the original has so much more to it and we shouldn't let it be eclipsed by the movie.